As the weather continues to heat up more and more as does the summer fishing! While the majority of us would rather be indoors lapping up some extreme air conditioning, anglers who chase the likes of mangrove jack, jew, flathead and big summer whiting are out braving the fierce heat, sweating up a storm casting and retrieving plastics, poppers, switchblades and bait into the strike zones. The 35 degrees (and then some) marks the true start of the summer season when you can expect sensational beach fishing. Whiting and dart can be hooked at the edges of deeper gutters where the swell is stirring up the sand and all the little crustaceans that inhabit the area. The golden rule is to fish as lightly as possible for dart and whiting so you may have some fun playing them in to shore. Use a similar bait as you would in the rivers – worms, pippies and squid. A #1 bait holder or #4 long shank hook, surf sinker and at least a 50cm leader of slightly heavier line will set you up to target these species. They will be feeding in the shallower gutters and can often be seen in the breaking waves if the water is clear. Top spots along the Sunshine Coast include Currimundi Beach, Kawana at Access 18- 20, Maroochy North Shore, Marcoola to Yaroomba, Sunshine Beach, Marcus Beach, Noosa North Shore and in front of Teewah village. The bigger fish – tailor and jew can also be targeted at night and on a full tide in teh middle of a deep green gutter. They have sharp teeth that will cut through line, so be prepared with heavier rigs, thicker line and some traces. Pilchards of the WA variety, gar, small mullet strips, froggies and white bait on a gang of linked hooks will do the trick. The beaches with a section of coffee rock or a headland nearby tend to be better for jew and tailor. Try Pt Cartwright, Pincushion, Yaroomba Rocks and the Noosa National Park area. If you are looking forward to seeking out a shady patch in one of the local rivers, then whiting, flathead, trevally or mangrove jack are the fish for you! Low tide is the preferred time of attack for a hungry whiting or flathead and often along a nice shallow patch of water beside a sand bank or mud flat. If trevally or mangrove jack take your fancy you need to be in known feeding areas with a lifelike lure, soft plastic or live bait and try to sit 1-2hrs either side of high tide. Whiting are the bread and butter summer species targeted by all types of anglers who love a challenge with light line as well as the reward of sweet tasting fillets that melt in your mouth. Whiting feed on shallow sand or muddy yabby banks throughout the local rivers. Whiting will forage in the mud feeding on small worms and crustaceans as they move along the banks. Blood worms, yabbies, soldier crabs, small pipis and sand worms are all part of the whiting’s diet. Recently anglers have been using small poppers no more than 4cm long to bloop over the banks on the making tide for quality whiting. The Gulp sand and blood worm varieties have proven to be an effective soft plastic on whiting in the rivers. Try Maroochy River Mouth to Black Banks, The Sand Basin and La Balsa Park at Mooloolaba, Munna and Culgoa Points in Noosa and just inside the Caloundra bar. Flathead are the ultimate ambushing predator which loves to feed up on the banks during an incoming tide and hang on the edge of drop off when the tides going out. They also love to feed around creek mouths, deeper holes, weed beds and river bends. Flathead will eat a wide variety of baits including live bait in the form of herring or mullet, fresh prawn, small pilchards and flesh baits. Soft plastics have been the most successful way to target flathead yet. Flathead, being the gullible fish they are, will hammer most forms of soft and hard lures which pass their nose. 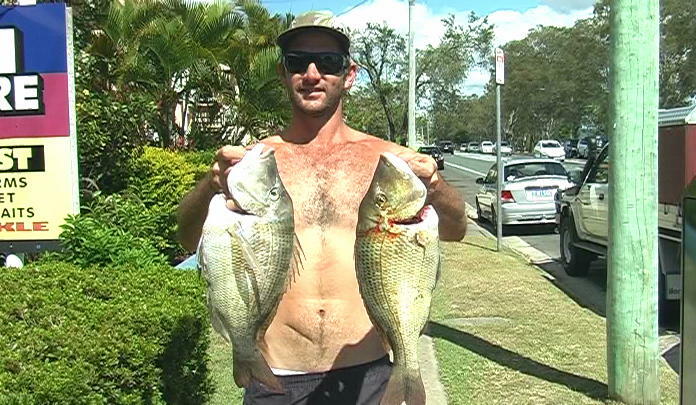 Fish all drop-offs and shallow beds in Pumicestone Passage, Currimundi Creek, Mooloolah River and Canals, Maroochy River and Noosa inlet. Trevally can be found on the high tide feeding around the schools of herring and prawns. They move throughout the rivers stopping at the usual creek/canal entrances, deep holes and channels, bridge pylons, rocky areas and along the edge of weed beds looking for moving bait. Basically find the schools of bait and you will usually find some trevally. These fish were built for speed and are born lure chasers. Some of the better tried and proven lures include: 20g Surecatch Knights, River2Sea Bubble Pop45, RMG Scorpion 68, Prawn Star Shrimp and Powerbaits in the 3inch size. All river systems between Caloundra and Noosa are playgrounds for this fun fighting fish! Mangrove jack rarely leave their snaggy hideouts unless you present a very attractive looking lure or livebait. Then they will hit hard and perform a perfect 180 degree turn and smashes the lure or bait apart on their way back to home. By the time you realise, the jack already has your line entwined in his snags and you are instantly busted off as the tight line touches one of the many oysters attached to the snag! Target jacks around fallen trees, rocky areas, mangrove roots, concrete pylons and deep holes holding bait – we have plenty of these structures in around McKenzies Bridge, the Cod Hole and Noosa Sound. The best bait for jacks is always live - like mullet, herring, prawn and gar. They will also slam mullet fillet and pilchards when extra hungry. With this in mind, it is worth popping away the winter bream rigs and breaking out the summer species set up you’ve been waiting to break out once the weather ‘heats up’! Flathead numbers in the Maroochy River have increased over the last month with plenty of quality catches over the weekend. 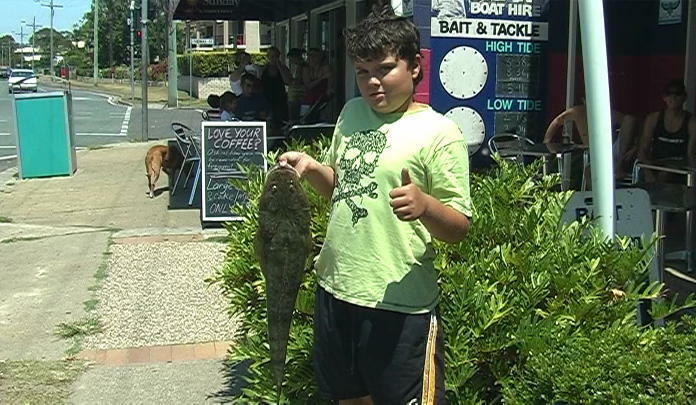 Jordan Matthewan was fishing with fresh prawn from Chambers Island with his family and caught this 70cm dusky flathead for his efforts. Golden, giant and big eyed trevally have been very active around the motorway bridge pylons with the recent influx of herring in the rivers. 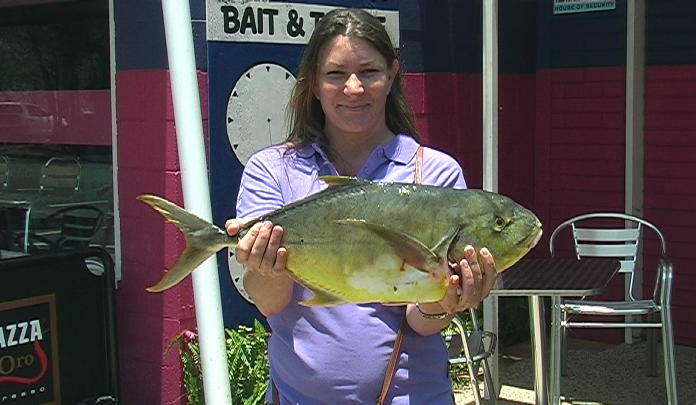 Barb McIntyre fished with a live herring in the early hours of the morning for this solid 3.3kg golden trevally. fillets around Old Women Island in the morning for a couple of kilogram fish. 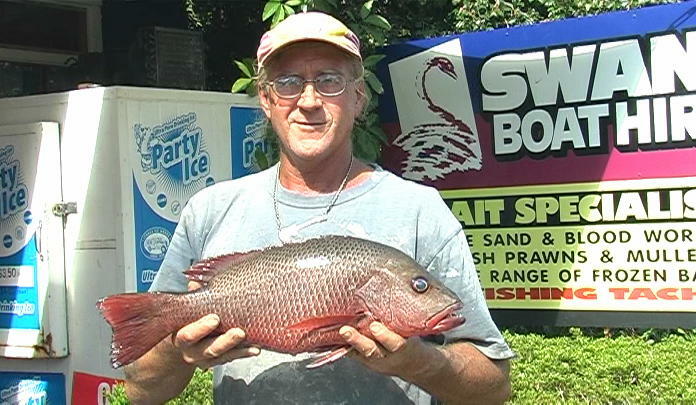 Hot humid days like those that the northerly winds have produced lately are prime conditions for mangrove jack fishing. Barry Neundorf fished with a live poddy mullet around the cane bridge in the upper reaches for this 2.75kg specimen.